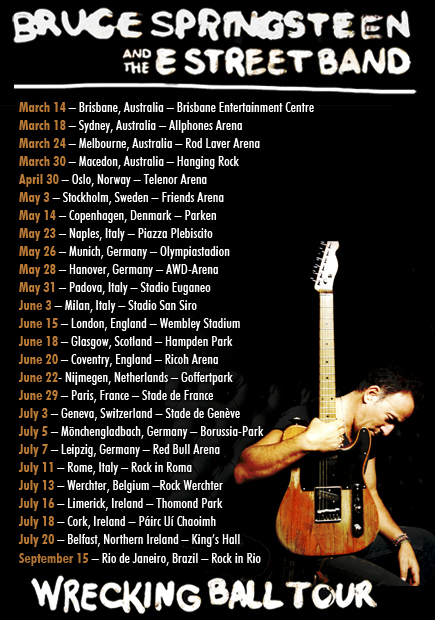 Bruce & The Street Band have announced new dates for the Wrecking Ball World Tour through 2013 with more to be revealed soon! Recent additions include multiple stops in Australia and Scandinavia. Please also note that due to tour scheduling, the previously announced dates for Naples and Padova have been reschuled to May 23 (Naples) and May 31 (Padova). Ticket on sale dates for both shows remain the same on December 7 at ticketone.it.